Our garden and our orchard are a special places for me. To be able to grow our own food is a wonderful thing. This page is to tell you what we are up to every month in the garden and orchard. With every farm, plans change and with this place our garden spots have danced all over our property. I will fill this page with helpful ideas and my own experiences with our garden. There are more pictures in our photo album, just click the link to see more. This year we are actually putting in a garden! Last year with everything going on we just put in a pretty garden of pumpkins, corn and sunflowers. This year we are needing to can and freeze a lot. We do a raised garden bed as our garden. I find it a lot easier to maintain, plus we leave the walkway large enough so we can dump barn waste in between. Which helps with weed growth. Right now we are in the process of getting ready to burn last year’s waste so we can get a till in. I have been planning what we need or want for the garden boxes as well. I have actually not started anything yet inside. We will probably start all of that very soon, but over the years we have noticed here in VA, that the growing season has been extended and if we wait a bit, that we can miss the first invasion of squash bugs! All in the planning and writing things down, to know what works for your area. We have not got the greenhouse built yet, because of everything else going, so leaves me to start everything inside! All in time. The Orchard is just waiting to burst out with leaves and flowers. We have had a couple very late snows, which are fine, if everything stays above freezing. We cross our fingers every year. Last year we were hit very hard with a virus in our grape vine, so this year we are having to cut back the vine, in hopes in saving it. We will fertilize the root and add some minerals to the ground to help it along. Was a blow, but it happens! We are so happy to see that our peach tree has come back and we also had 2 volunteer tress come up in our blueberry boxes! Once we know that we will have longer days of warm weather, we will move these guys to a better location. The garden has changed in leaps and bounds. It so interesting, still to this day, how fast it changes in the summer. Our pear trees are done producing and now are apples are ready to be picked too. We lost one apple tree to crows! I tell you we fight them every year and they either get pears or an apple tree. I just don’t have the heart yet to fight them, but may have to happen soon. The tomatoes that I planted in the 5 gallon buckets are doing great. I have had perfect looking tomatoes and really no bugs. If this keeps up, this may be how I’m doing my tomatoes from now on. I never really tried them like this and I’m glad I did this year so I can share in the experience. The Indian corn and popcorn are now over my head! Everything seems to be going fine, but we will wait and see if the worms have gotten to them. This is always a fight when you are growing things organically. The pumpkin vines have taken over the garden. I’m finding this year we have a lot of blooms, but really not a lot of Pumpkins. I’m guessing we have had a really weird weather pattern, so maybe this is why. I’m going to ask some other pumpkin growers if they experienced this at all this year too. Oh gosh my sunflowers are right at the verge of blooming. I really can’t wait to see the garden full of sunflowers, it will be so pretty. At the Grand Opening the garden was a hit. They loved the lay out and what we were doing here at Cranberry Acre. Was a great day and I loved sharing our ideas with them. I hope to share more with people over the years, when we start with classes next year! If you would like to see more pictures of our garden and Orchard, please click the link. I can’t believe it is already July! All of my fall plants are in the garden, Pumpkins, Corn, sunflowers and beans. Time really has gotten away from me this year with us working on getting the store and studio ready for opening day. On our paint day one of my friends helped me out by tilling my garden. What a life saver! Our garden is now doing great even with the neglect. We planted all of our Heirloom tomatoes in 5 gallon buckets this year so we didn’t have to worry about them getting lost in the sea of pumpkins. I also changed my plans and have planted all the pumpkins and corn in the boxes to help when they are young for weeding the paths. Seemed like the way to go as I was working in there. We are still leaving an area to drop all the barn waste and hope we find people who would like to take some home with them for their gardens. The orchard part is doing great. My pear trees have produced nicely and my apples, there are a lot but with the squirrely weather I think the size will be smaller than normal. Which is fine, because they cook up the same for applesauce an apple butter. We have gotten all the plants started for opening day. Cannot wait to see the kids planting their plants and learning about re using objects that would have been trash! Life lessons that need to be taught to our young people. This is one of goals here at Cranberry Acre to share this knowledge with them so they can pass it on. If you would like to see more pictures of our garden and orchard, please click the link below. We are ever so slowly getting the garden together. I have planted my pumpkins and tomato plants in pots and do hope to have them in the ground in the next week or two. 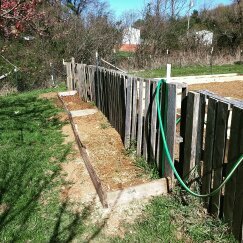 I’m needing to get the garden tilled so we can also put in our popcorn and sunflowers. Seems like time has gotten away from me here on the farm. Hopefully this coming week we will be out there tilling and planting. The tomato plants are looking very healthy. I hadn’t planned on tomatoes, but were given some seeds, so I planted some. I will be selling some at the local farmer’s market, so I don’t feel pressured into planting them all. The two little peach trees that I transplanted are growing very nicely in there pots and I will have to soon put them in a bigger one so they can live in it all summer and fall. It is amazing how fast they grow. As for the Orchard, well it is full of life! We were able to pick some strawberries this year and from the looks of it will have blueberries this year. Very exciting to see. Our pear trees this year are full of pears, so pear butter will be made this year. The apple trees also seem to be very full, so apple sauce and apple butter! The poor peach tree is actually producing fruit too, but it will only be enough for maybe a pie or cake. After what it went through last year, I really did not expect anything from it. We have been blessed this year with fruit and also beautiful flowers. This year my iris decided to bloom these beautiful white flowers. They were so huge! My rose bush is over run with blossoms this year and the garden space smells of rose. I love this little space so much! To see more pictures of what is going on in the garden, please click the link below. Wow! I can’t tell you how much the Orchard has grown in just a matter of weeks. In March we were scared that we had probably lost all our peaches but by the end of April we soon found out that we were blessed with peaches. Everything worked out. The orchard went from bare, to flowers, to fruit in just weeks. It is so pretty to watch and I think next year we will be looking into getting a honey bee hive here on the farm. I saw a couple honey bees in our trees and realized that we could probably support a hive here on our one acre farm. Would be a nice addition to what we already have. Apples and pears we will have many of this year. My one pear tree is over run with pears and I will have to try to get in there to pick out the small ones, so our tree does not try to break from the load. This sometimes happens with these semi dwarf trees, they were not made to take the weight as well as an average fruit tree. I’m so happy to also see that Ms. Ayla’s berry plants survived the winter and are in bloom. Raspberries, blueberries and strawberries, I really can’t wait and Ayla can’t wait to use them in her baked goods! I finally have done my ordering of our fall garden seeds. We have so much going on that I had decided that I wouldn’t really have too much time to take care of a summer garden. This year we will be doing pumpkins, winter squash, gourds, loofah, sunflowers, cow peas, popcorn, and Indian corn. The idea is to stuff our garden space with all of this so it will look pretty as it grows and by fall we can gather it. We are excited to grow loofah this year to have for our soap line! We have been buying on line, but really wanted to start growing the things we needed for our own products. Loofah gourds will be the first of many things we start to grow and use in our products. All of the other produce we have, whether decorative or eatable will be offered at our store for purchase this year. I really can’t express how excited I am for this! To see more pictures of our garden and Orchard, please click on the link below. Everything is in bloom here on Cranberry Acre! We had thought that we were going to lose all of our peaches to the freak snow storm we had, but it looks like we may have a small batch. I saw our first honey bee on the blooms of my peach tree, so there is hope! Ayla’s Raspberries, strawberries and blueberry plants, seem to also have done well. It seems like Spring is here to stay. We have had warm day and rain showers for the past week, and the Orchard is now getting ready to bloom. My Golden Delicious has flower buds, as does my Bartlett Pear. Looks like a good year for my trees! I will keep my fingers crossed, but I do believe we are done with the deep freeze. In our spring we found more signs that the warm weather is here to stay. We have what look to be frog eggs in the spring. Hope our ducks, Coconut and Hershey do not find them and they have a chance to grow up. We are getting ready to prep the garden by spreading out all the barn waste from the Winter. As I said before, we are not growing a traditional garden this year. We have decided to go with the three sister’s idea, of corn, beans and squash. We will also be adding sunflowers, just because I love my flowers. I was very happy to see that Corona’s flowers on her grave have bloomed this year. Last year they were gotten by the frost and never had the chance. We miss that old dog very much. One of the days that I was taking pictures, a butterfly followed me around and when it finally stopped, I took a picture. Spring is here! If you would liek to see more pictures of the Garden and Orchard, please click on the link below. Nothing really new for the garden. We lifted all the boxes in the garden, so we could just add new manure to it. The weather has been so crazy with it being close to 70 degrees then dropping to the 30’s at night, that the idea of trying to plant seedlings, just doesn’t seem like a good idea. When we get the Greenhouse built, it will be a different story. Plus this year we are not really planting what we usually do, we will wait. My only fear right now is that all our fruit trees look like they want to try and bud out, if it freezes when they do this, then we will lose all our fruit. As a farmer you really don’t have control over the weather, it would just be a sad thing for us this year, I wanted to make jelly! Our Japanese Magnolia has tried to bloom, but I think this last frost may have killed it, so sad. My husband’s Willow tree has leaves on it now. I was so surprised to see it with leaves, I guess everything is ready for spring. I want to be ready for spring, but have a fear of a snow or freeze still to come. Oh well, we will keep our fingers crossed and hope the frost stays away! To see more pictures, just click on the link below. I think I have finally caught up to a place on this Blog page to state what we are planning on doing for this year’s garden. This year we have a lot of building and fixing of the house projects, so I decided that I will grow a pretty garden with a few things we could harvest. I will not have time this year to maintain a family garden that will need my attention every week. My daughter Ayla has been wanting to grow pumpkins, so this year will be the year! The plan is to pull all the boxes off the ground and get in a till. We will still be leaving enough room to get a wheelbarrow in, but we will be planting pumpkins, decorative corn and a type of runner dry bean. Oh yes and Sunflowers!!! This way it will not really need a lot of my attention and when we have time, in the fall, we can harvest things that won’t need to much work to put away. I may grow greens in pots but not sure yet. This is the plan, we will see how close we stay to this in the spring. We will have pictures of this project in the photo album, just click the link below. In the "Old Garden Spot" post, I stated how hard was to maintain a 1/8 of an acre garden. We did half that and then eventually moved the location to the Orchard area and tried it there for a year. We actually made it smaller when we moved it surrounding the garden with a pallet fence. You think this will be easy making a pallet fence but nothing is easy really. 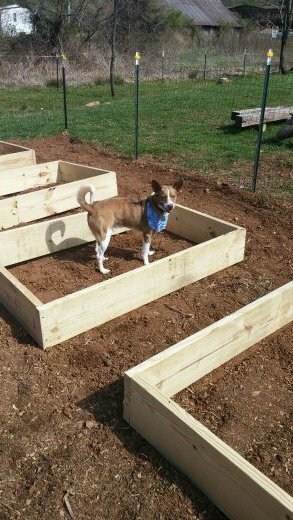 When we started the plans on the new edition to the barn, we went to a smaller garden. In doing this we had to take down a large portion of the pallet fence. Again was not easy to take apart at all. In doing different sized gardens, with different game plans, we decided that this new garden was going to have boxed and raised beds. We made the paths large enough to get a wheel barrow in so we could keep dumping barn waste in the paths to keep down weeds. This seemed to work well last year. In putting the barn waste in the rows we found out that our beds were not getting dry, which always seems to be a problem with this type of garden plan, but the manure must have kept the moisture in. We will be doing this from now on. There are more pictures in our photo album page, Garden and Orchard, just click the link below. What’s the point of having a garden if you can’t share its beauty? I love the beauty of a garden when it’s just getting ready to turn into a crazy jungle. Everything in it looks so well organized and beautiful. We have over the years figured out what we need to grow and how we need to plant it. It is a learning process for a gardener. Not every area is going to have the same growing season or even bear the same produce. We have trialed a little bit of everything and now we stick to the steady producers that work for us. Usually we will have a bush green bean, a lettuce patch, an herb garden with flowers, summer squash patch, potatoes, a tomato patch and then a surprise patch. We now just produce enough to eat and put away, if we have extra it goes to our neighbors and friends. If you are interested in seeing other things we have raised in our garden, just click the link below. When we first moved here, I knew I wanted an Orchard of some type. Apples, peaches, pears and grapes were on the list. We cleared the back pasture area and then ordered our trees. We ordered, apples, peaches, cherries, and pears, we planned on getting Semi-dwarf trees due to the size area we were planting in. We wanted this area to be animal free, a place we could have a campout or a BBQ. The first year was horrible, who new deer liked cherry trees? I didn’t! We lost all three of our trees that first year to deer. We also in that first year lost one peach tree, but we were okay, we had two more that were beautiful. Our pears and apple trees did okay the first year. By the second year we lost one of our Gala apple trees and a peach tree tipped over because of too much rain. By our third year we were getting fruit from all the trees and we canned our first apple butter and applesauce. We also made some pear butter from our pears. In that first year we also planted some grape vines on a trellis we made. One pink, one green and a concord. In our second year we acquired a fox grape vine and another concord, which gave us our first fruit to can. That year we made jellies and grape juice! We have grown since then and have added 2 beds of berries. We hopefully will have blueberries, raspberries and strawberries this year. From the looks of it everything is doing well during this Winter. If you would like to see more pictures of our beautiful Orchard and its bounty, just click on the link below. One thing I think people forget about in designing a garden, is flowers. I’ve always had some type of flower in my garden. Some of these flowers help discourage harmful bugs from coming to produce, then some are just there to look pretty and help draw in helpful bugs. We always plant Marigolds and I mean all types of them. It helps us to know where are rows begin in the garden. Usually they go where we are planting squash to help ward off Mexican bean beetles, and squash bugs. Sunflowers are a huge part of our garden, whether it is the large seed sunflowers or the nice cutting sunflowers for arrangements. Zinnias and cosmos are also a mainstay in our vegetable garden. I just love the idea of being able to pick produce and then have a bouquet of flowers to also come into the house. To see more pictures of the flowers growing on Cranberry Acre, just click on the link below. Everyone starts out very ambitious when they think they are going to grow a garden. You think, why yes I can take on a garden that is a 1/8th of what you own, that you will produce enough to harvest and to sell. What we forget is if you are doing this buy yourself, while raising 2 small children, well it is a lot harder than you think. I found myself so overwhelmed with such a large garden. As with every garden it kept changing, until it worked in a way that I could take care of it myself. This garden every year changed. It went from a 1/8 of an acre, to half that size, to a new location and then half that size, then eventually to a beautiful raised garden, which is just big enough to take care of us and I can do the work by myself. The best advice I can give is, you need to know what you can take care of. A garden can go from nice and beautiful in early Spring, to a jungle in a matter of weeks in the Summer, leaving you to go on an adventure every time you are looking for your produce. More pictures of our garden and its transformation, please visit the Photo Album page under garden & orchard, just click the link below, Garden and Orchard. Thank you for supporting Cranberry Acre. Visit our store by clicking on the link.